I'm sure you know it. It happens when you see yet another headline saying something about "Guns in the U.S."- and you know the author is going to repeat the same agenda-skewed lies and irrelevancies you've heard over and over and over. Yep, that's the feeling I felt when I saw this: "Guns in the U.S.". Michael Shermer is a frightened "libertarian", just like Scott Adams. Wishy-washy and unable to stick to principles and reality. He is happy enough to embrace libertarianish reason, unless it leads to conclusions he doesn't want to face. In that case he'll embrace the "progressive" agenda. It makes him look more intelligent. Or so he believes. What it actually does is expose him as a coward. He's frightened of your liberty and doesn't want to be responsible for his own defense. And that's sad. I could go through the whole article and point out the bad assumptions, the way the "data" was milked to get the numbers to come out the way the anti-liberty bigots wanted them to come out, and point out what was purposely left out... but I've done it to similar misleading articles in the past, and so have many other people. And the "smart" quasi-libertarians won't listen anyway. Long ago, before I got one of these "computer" things, and while living in a location more befitting my personality, I spent hours each and every day (after work or on my days off) sitting beside a campfire. Yes, I ignored government "burn bans" completely. Between my house and the river was my camp. My tipi was set up there. I had my tomahawk block handy for when I felt like a bit of activity. I had my setup for processing deer skins into buckskin. And I had my wikiup. That's where my campfire was. In winter I would sweep away the new snow before I built my daily fire. In summer I would sometimes crawl into the wikiup to weather a mountain shower. On the floor of the wikiup was a raw elk hide, beneath which the voles had made their little half tunnels. Voles would also run along the beams inside the wikiup as I sat watching. Often, if the rain continued for very long, I would fall asleep for a while- waking up to bright sun. I had built the wikiup using only materials collected on site. And, as an extra challenge, I had used no tools but my hands and maybe a few rocks. Not even a knife. Generally I sat outside, on a log in front of the elk hide door of the wikiup, right beside my fire. I never used anything more modern than flint and steel to light the fire- and almost exclusively used the bow drill. Even if I was very tired- or it was raining or snowing- I couldn't bring myself to use matches or a lighter. I got very good at firemaking with all the practice. 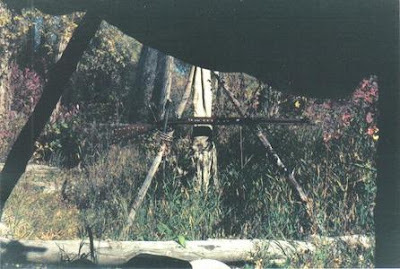 My black powder rifle normally hung nearby on a tripod I had constructed for "storage". I usually wore my buckskin clothes while out there. Modernity of any sort seemed out of place. This was the most free I have ever felt. I would watch rafting tourists and kayakers drift past (and sometimes get dumped into the icy cold water). The times I let them see me, they would usually just stare and forget to return my wave. And, the fireside is where I chose to socialize. I had a couple of friends who knew this was where to find me. They would show up to sit and visit. One friend would come to tell me about the people who were after him for whatever reason, and his latest "anti-government" theories. And sometimes about his newest run-in with the local "Law". He had a lot of them. I even helped out lost tourists. Usually lost fishermen who somehow "lost" the river while walking to a new spot to try. Or their cute wives and daughters. Never did figure out how they could lose the river. But, I enjoyed helping the occasional Damsel in Distress find her way back to her family group. Thoughts of shooting people for trespassing never entered my mind. Well, maybe that's not totally correct. Sometimes rafters/kayakers would beach and poop in my "yard" (in the woods) near the river. There are drawbacks to everything. Sitting beside that campfire is also how I spent midnight when the calendar rolled over from 1999 to 2000. That night I had no idea my time there was quickly running out. I guess I am just thinking lately of how drastically my life has changed in "only" 15 years. Marty McFly and his DeLorean have nothing on me. It's October 21, 2015- the "future" day he supposedly visited in Back to the Future 2. A good day to think about time. I honestly feel like a time traveler most of the time. Maybe now you can understand why.